The girls Eagles played to an eventual third place finish in tournament play this weekend. 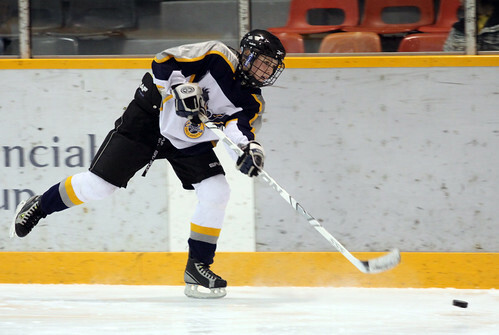 A busy weekend for Eagles hockey as the Girls host their annual tournament and the Boys meet Geraldton in exhibition play. The Girls played St. Thomas Aquinas from Kenora on Friday afternoon, defeating them 6-0 in front of a crowd of DHS students. Friday evening’s game saw them take on the Fort Frances Muskies with a final score of 3-2 for the Eagles. It was a hard fought game, with the Eagles trailing 2-1 until late a few late game goals brought them out ahead. The Eagles ended up in third place in the tournament, with Red Lake taking second place and Fort Frances coming out on top. The Girls next game is at home vs. Fort Frances this Saturday. In Boys hockey. on Friday the Eagles won over Geraldton with a score of 6-2. Goal Scorers were Daimon Wesley, Ethan Egli, Josh Reid, Grant Valiquette, Blair Dingwall and Kyle Hamilton. Jared Stratford was an offensive asset with 3 assists. Kim Wildhaber took the win in net for the Eagles with a solid performance. The teams met again on Saturday with a final result of 11 to 3 for the Eagles. Grant Valiquette, Zack Pitchenese and Matt Bartlett two goals a piece, with singles added by Josh Reid, Blair Dingwall, Daimon Wesley, Ethan Egli and Jeff Kropelin. Zach Lake was in net for this game. The boys travel to Fort Frances Tuesday for their second game of the regular season.